5 It is not conceited (arrogant and inflated with pride); it is not rude (unmannerly) and does not act unbecomingly. Love (God's love in us) does not insist on its own rights or its own way, for it is not self-seeking; it is not touchy or fretful or resentful; it takes no account of the evil done to it [it pays no attention to a suffered wrong]. If we would practice this passage daily, we could live peaceful, productive lives. The problem is, our flesh often gets in the way. Instead of ignoring injustices that are done to us, we want to get even; instead of walking in love, we want to repay evil for evil. One of the things I witnessed in the life of my father-in-law, Kenneth E. Hagin, was that he not only taught about the love walk, he truly lived it. He never considered getting even. At times, my husband and I got exasperated when we heard others criticize and say hurtful things about our family or ministry. Sometimes we expressed our feelings to my father-in-law, but he would tell us, "Don't ever stoop to their level; always walk the high road." I'm forever grateful for his example and for his being straightforward with us. I still hear those words ringing in my ears when I'm tempted to take the low road and return evil for evil. The test of walking in love is not something we pass one time and never have to experience again. The fact is, our love walk will be tested continually. Sometimes it seems as if I experience those kinds of tests on a daily basis! Life is too short to live in constant turmoil in your home. This holds true regarding your relationships with friends as well. When strife arises in our relationships, we can deal wisely with it and keep First Corinthians 13:4-7 as our foundation. We can learn something about this from the Apostle Paul. The church at Corinth was suffering from such strife within it that he had to remind the members, "Be perfect, be of good comfort, be of one mind, live in peace; and the God of love and peace shall be with you" (2 Cor. 13:11). I believe we should adopt as our family motto, "Be of one mind. Live in peace." In order to live out that instruction from Paul, we must learn to communicate effectively with others, beginning with our spouses and children. Communication is often the most difficult skill to master, because we can experience so many different emotions when we are sharing our thoughts and feelings. Paul talked about this in Ephesians 4:26-27: "Be ye angry, and sin not: let not the sun go down upon your wrath: neither give place to the devil." "Be angry and sin not" sounds like a contradictory statement, but it isn't. The Lord knows that anger is one of the emotions we experience in life, yet He tells us, "Although you may be feeling angry, do not sin." What exactly does that mean? You may experience angry feelings, but don't use those feelings to get even. In the midst of anger, you might say words that you may not really mean, but those cutting words will forever ring in the ears of the recipient. 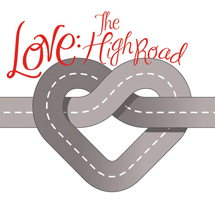 When we choose the high road, love, it causes peace to reign in our relationships and in our lives. It's important to express your love and appreciation for your family and friends on a continual basis. My husband and I make it a point to say "I love you" to each other many times a day, and I often say that to my children and grandchildren. We all need to be reassured of the love others have for us, and we need to reassure others of our love for them. You may not have heard anyone say to you, "I love you," very often in your childhood, and you may find it awkward to say those words yourself. But I encourage you that if you'll start saying, "I love you," to people you care about, each time you repeat those words, they will become easier to say and more natural to you. You can begin right now by determining that every day, not just on special occasions, you will walk in love and express words of love to your family and friends.